1. CD8+ T cell mediated conditions such as autoimmunity and T cell leukaemia. 2. Targeting the CD8 co-receptor for therapeutic benefit. - Block the pathogenic CD8+ T cell attack observed in autoimmune disease and transplant rejection (Mathew Clement). - Enhance CD8+ T cell immunity especially in a cancer setting where responses are suboptimal (Tamsin Williams). We are interested in understanding both of these interactions and how to manipulate them for therapeutic benefit. 3. 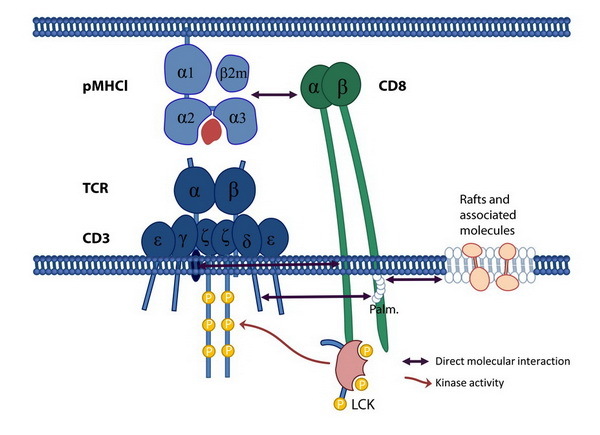 Development of technology to study the TCR and CD8 co-receptor. Our overall aim is to understand the mechanisms of CD8+ T-cell mediated disease and use this knowledge to develop novel therapeutic reagents. Further information about Professor Linda Wooldridge can be found here.